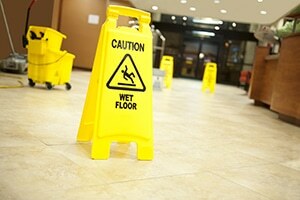 Dangerous walking surfaces can cause devastating harm. Fall injuries are the second leading cause of accidental deaths, behind motor vehicle accidents. While many people of all ages suffer serious, life changing injuries from trip or slip and fall incidents, the Centers for Disease Control and Prevention (CDC), finds that seniors are especially vulnerable in that , each year, about 2.5 million senior citizens go to the emergency room as a result of falls. Property owners and managers have a legal duty to maintain their premises in a reasonably safe condition for guests, customers and others who are lawfully on their premises. Unfortunately, these owners and operators of stores, hotels, restaurants and other commercial premises, as well as residential premises owners, often fail to comply with this duty. This all too often results in unsafe walking surfaces. These dangerous conditions can manifest themselves in a variety of ways including, among others, building code violations, irregular or broken walking surfaces, spills or leaks that cause wet and slippery conditions, loose cords or wires in walkways, broken/uneven steps, obstructions and missing or damaged handrails. Slip and fall or trip and fall injuries can include a wide array of severe injuries, such as fractures (broken bones), a fractured or traumatically injured cervical (neck), thoracic (mid-back) or lumbar (lower back) spine, spinal cord injuries, herniated discs, the need for surgery, nerve damage, paralysis, traumatic brain injury or even death. Property owners and managers are not automatically liable for injuries that occur on their property due to defective walking surfaces. They, however, can be held legally accountable when they fail to maintain their walking surfaces in a reasonably safe condition or fail to warn of dangers about which they had or should have had knowledge. When carelessness causes what can sadly be irreparable harm, property owners and operators can be required to pay substantial sums of money to compensate individuals who suffer injury due to negligently maintained and operated walking surfaces. When you or a loved one has suffered from a slip and fall due to unsafe premises, it is essential to have the best possible legal representation available to ensure that you and your family receive not only justice but also the maximum compensation possible under the law. The premises liability lawyers at Boyers Law Group have won many millions of dollars for clients in a wide variety of cases involving defective and dangerous walking surfaces. Because we genuinely care about our clients, we understand that our clients are depending on us to use our extensive experience, skill and commitment to superb advocacy to hold wrongdoers fully accountable for the life-altering harm that they cause. So, if you or someone you care about has suffered serious injury from a fall due to an unsafe walking surface please call the Miami Slip and Fall Attorneys at Boyers Law Group for a free consultation today. When you or your loved ones are injured due to the negligence of others, you need a true champion to advocate for you. You can reach Your Boyers Law Group at 800.545.9100.